Once again an airline is in the headlines for the wrong reasons. This time it’s BA trying to recover its reputation following a damaging spell in the headlines after an IT failure left thousands of travellers stranded. With its service now operational again, attention will turn to how the brand can both placate customers that have had their holiday plans affected because of cancelled flights, and also convince the wider public of its reliability. YouGov brand tracking data points to how badly this story has impacted on perception of British Airways. 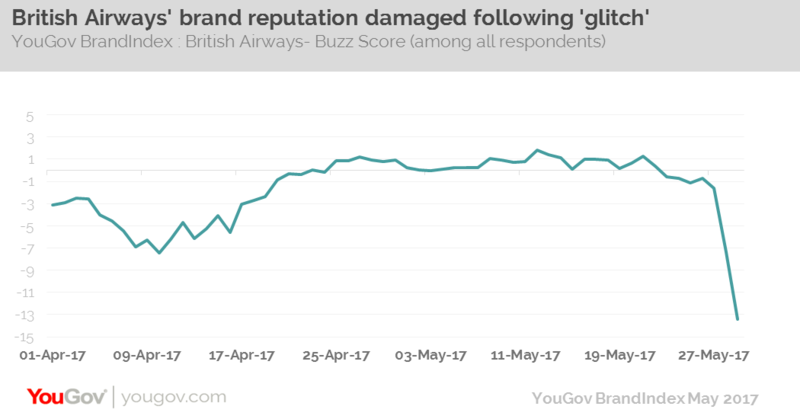 Among the public at large, the airline’s Buzz score (whether someone has heard something positive or negative about the brand in the past two weeks) has dropped dramatically from -1 to -13 in just 5 days. Further to this, the brand’s Impression score (whether someone has a favourable impression of the brand) has fallen nine points, from +40 to +31. While BA still leads the airline sector on this metric, the gap to its competitors is closing, especially among those aged 18-34. The knock-on effect of this is that its Quality score has also decreased by 6 points. Of course, the worry for the company is that customers who were loyal to BA due to its reputation for quality will now see it as no different from cheaper ‘budget’ airlines. Indeed, the latest incident compounds the drop in perception we saw when the airline previously experienced an IT glitch, and cut its food option on short haul flights. Our brand crisis data repeatedly shows that brands that react quickly and efficiently to a crisis are able to limit the damage a scandal creates, for example Pret A Manger and the uproar about its employees on work experience. However, over the weekend, BA was tardy in offering a spokesperson for interview, all the while customers complained loudly online, in person, and through the media about a lack of communication and a thorough explanation from the carrier about what was going on.